I know I know, Rachel is the official Cake master in the imaginary bakery my friends and I share. BUT Rachel likely needs a day off once in a while. So for those days, I have decided to take a cake decorating class. Also, because it’s cool and I want to learn how to do fun and pretty things with cakes and cupcakes. The Wilton program has three different classes: (1) Decorating Basics, (2) Flowers and Cake Design and (3) Gum Paste and Fondant. I plan on taking all of the classes, so I’m starting with the Decorating Basics. Hopefully, by the end of the year I’ll have taken all three and be showing you gorgeous cakes!! Our first class was last week and was just an introduction to everything. 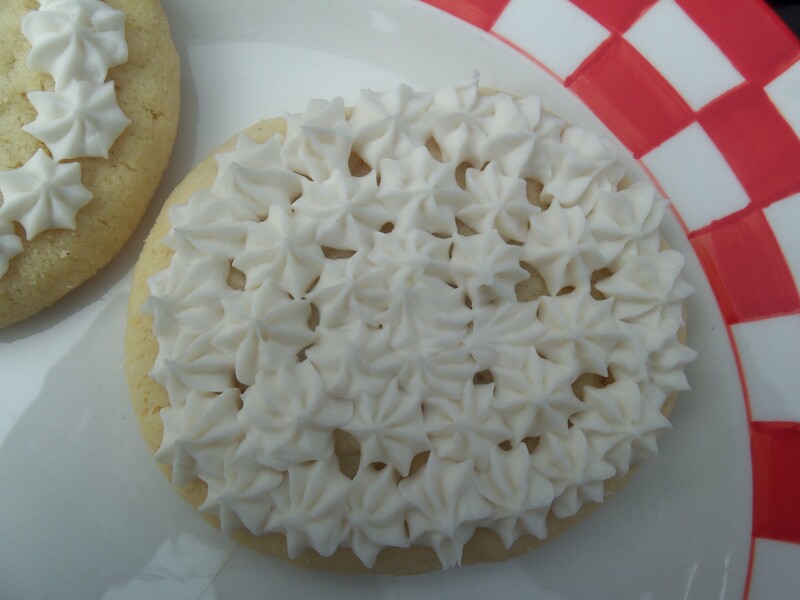 We learned how to make the classic Wilton buttercream icing (which I give the recipe for below) and how to make frosting stars. 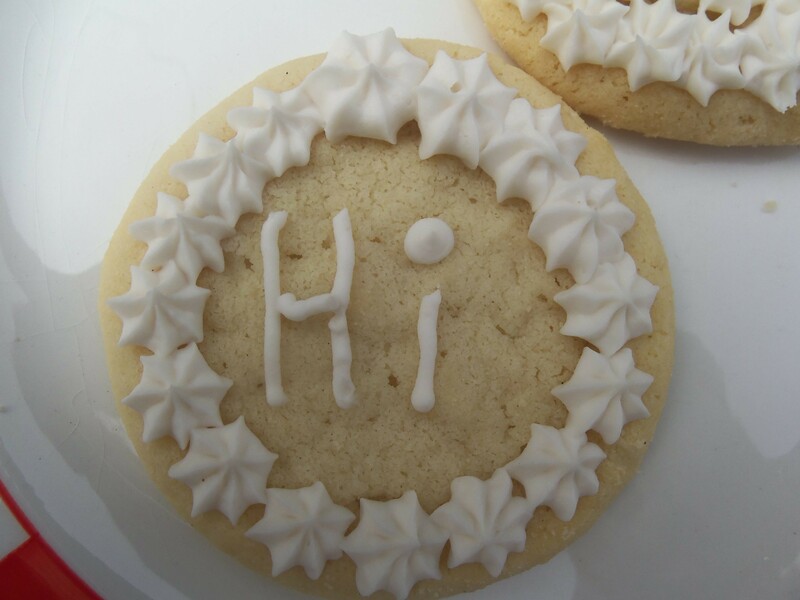 As you can see from my pictures, I might as well already be a professional cookie decorator. (1) Gently mix shortening by itself. This will help incorporating the rest of the ingredients much easier. DO NOT use a whisk. If you are first starting out, do not use butter. It will melt too easily. Start with shortening and when you get better you can switch to butter. (2) Add flavoring, meringue and salt. Flavoring Tip: if you use regular store-bought vanilla that is brown in color, remember it will change the color of the icing. Try to use a clear flavoring instead. (3) Add 1 tablespoon of water + 1/3 of the powdered sugar. Stir until all ingredients are wet, not mixed. Repeat 2 more times. Then, lastly, add one more tablespoon of water. Don’t put the water in before the flavor, meringue and salt or the combination will begin to separate with the shortening. (4) Once everything is stirred and wet, wait 90 seconds. Do not let it sit for too long. Mix for 30 seconds, scrape the sides and repeat in 30 second intervals three more times. * For a full cake, you will need 3 servings of this recipe. 1 for the crumb coat, 1 for the top coat and 1 for decorating. Although it’s a pain, make each portion individually. There is nothing worse than wasting 3 pounds of powdered sugar, because you messed something up. This week’s homework is to make a two layer cake and put on the crumb coat layer of icing as well as the top coat of icing. Then in class we’ll make a cupcake design on the top. My cake will be a lemon cake with raspberry filling. Sounds wonderful! Can’t wait!! My grandmother and I were discussing whether or not people still used shortening to make buttercream frosting. Is that why it’s so delicious? Because it has artery-clogging shortening in it? :p BTW, your thread on TLS brought me here. It is very delicious! 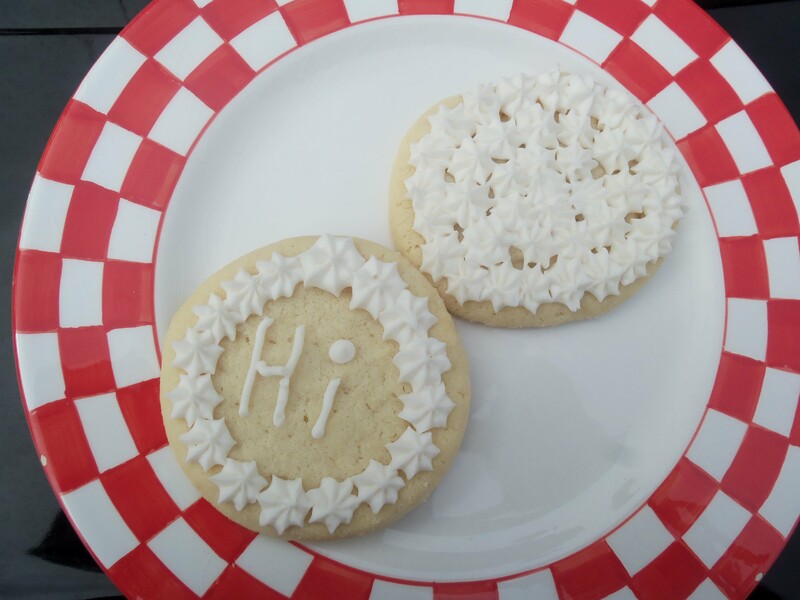 While everyone was discarding the frosting they practiced with, I was eating it.